A colleague recently put me on to JADE (judgments and decisions enhanced). It's provided or supported by BarNet, which —it turns out — has been around for 8 years. BarNet is run in NSW, primarily aimed at barristers at the NSW Bar, though it's not (it seems) a NSW Bar committee or service. JADE provides an alert service for new judgments, and digest service for feeds of new cases by topic and brief outline of their content. You can read about JADE here. A new feature offered by JADE is CaseTrace, which provides a subsequent judicial-citation service. The difference with JADE's version is that it will provide pinpoint references to paragraphs! It's easier to see it, than explain it. For example, I searched for Dyers v The Queen. 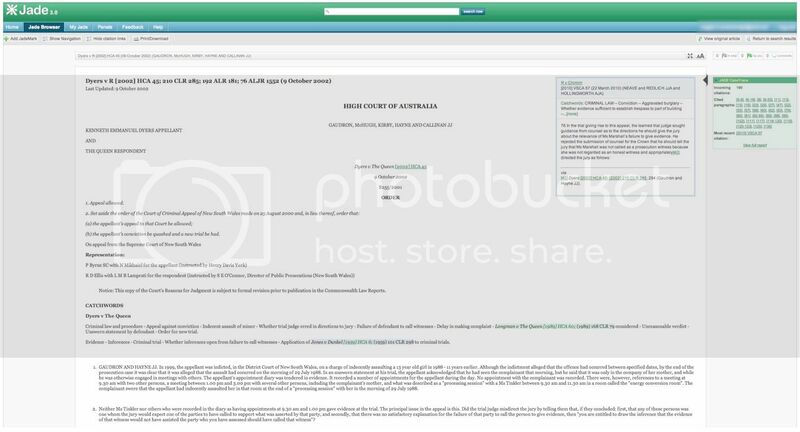 In the right-hand side of the screen you can see CaseTrace, showing which paragraphs have been cited in later judgments. Clicking on any of those hyperlinks will jump to the corresponding paragraphs, and an expanding menu to show the subsequent citation history of those paragraphs. There's also a most recent citation option, which you can see displayed in the picture above. What a beautiful interface, and what a marvellous tool. Thank you. And some people who seem to 'get' how legal research should feel online.